A broadcast journalist for more than four decades, Bill Moyers has been recognized as one of the unique voices of our times, one that resonates with multiple generations. In January 2012, at the age of 77, Moyers began his latest media venture with the launch of Moyers & Company on air and online at BillMoyers.com providing conversations on democracy and explorations of contemporary culture, making sense of what matters to us all. 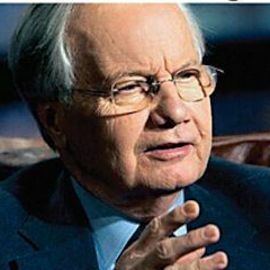 With his wife and creative partner, Judith Davidson Moyers, Bill Moyers has produced such groundbreaking public affairs series as NOW with Bill Moyers (from 2002 through 2005) and Bill Moyers Journal (from 2007 through 2010). Since the companys founding in 1986, other notable productions have included the landmark 1988 series, Joseph Campbell and the Power of Myth, as well as Healing and the Mind, The Language of Life, Genesis, On Our Own Terms: Moyers on Dying, Moyers on Addiction: Close to Home, Americas First River, Becoming American: The Chinese Experience, Faith & Reason, and Moyers on America. Moyers began his journalism career at age 16 as a cub reporter for his hometown daily newspaper in Marshall, Texas. He was a founding organizer and deputy director of the Peace Corps and special assistant to President Lyndon B. Johnson. Moyers served as Johnsons press secretary from 1965 to 1967. Moyers was elected to the Television Hall of Fame in 1995. A year later he received the Charles Frankel Prize (now the National Humanities Medal) from the National Endowment for the Humanities for outstanding contributions to American cultural life. In 2005, Moyers received the PEN USA Courageous Advocacy Award for his passionate, outspoken commitment to freedom of speech and his dedication to journalistic integrity. He has also been honored with the National Academy of Television Arts & Sciences Lifetime Achievement Award. The Museum of Broadcast Communications calls Moyers, One of the few broadcast journalists who might be said to approach the stature of Edward R. Murrow. If Murrow founded broadcast journalism, Moyers significantly extended its traditions. Moyers books include such bestsellers as Listening to America, The Power of Myth, Healing and the Mind, The Language of Life, Moyers on America: A Journalist and His Times, and Moyers on Democracy. His most recent book, Bill Moyers Journal: The Conversation Continues, was published in May 2011. He currently serves as president of the Schumann Media Center, a non-profit organization that supports independent journalism. Veteran broadcast journalist Bill Moyers was named Wednesday by the Rutgers Board of Governors as the university's commencement speaker. He will be awarded a Doctor of Laws.